NYRA officials seem very pleased with the numbers posted for the first four days of horse racing. Considering that the first two days were conducted in sweltering heat and the fourth was held in the rain, that the track was able to attract 350 more people each day on average than last year is a development in which they should rightfully take pride. 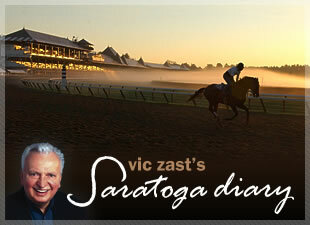 Regardless, of what anyone thinks, Saratoga remains the “August Place to Be.” Habit dies hard at the Spa. Well, you know that. Before anyone starts turning cartwheels, however, there’s something to keep an eye on. On the three dry days, fans left the racecourse in droves after five or six races. There were more empty seats than occupied seats from Section H to the end of the grandstand when Georgie’s Angel won the Schuylerville, Overdriven won the Sanford and It’s Tricky won the CCA Oaks. Should the top weekend stakes be moved up in the program and the second stakes on the program moved down, like they do in England? Those who did brave the downpours on Monday viewed a variety of finishes. The finishes that were close came in the first race when Joonbi went wire to wire to win by a nose, in the fourth when Golden Weekend won by a head from off the pace and in the featured eighth race, the Evan Shipman Stakes for New York-bred horses, in which Icabad Crane came from way back to nip Stormy’s Majesty at the wire. Despite spelling his name wrong, Earle I. Mack’s six-year-old gelding does a lot of things right. He’s cashed $548,895 in purse money. More Than Real faces Winter Memories in the Gr. 2 Lake George this afternoon. But the best horse race today will go off at 10:10 am and be seen only on TV screens. The late-charging Canford Cliffs defends his Gr. 1 Sussex Stakes title against the tactically-speedy Frankel at Glorious Goodwood. Several years ago, NYRA began televising British horse racing on the Saratoga grounds to the delight of early arrivers and international horse racing aficionados. Frankel, as you know, is the undefeated three-year-old colt named after the late Bobby Frankel – horseman extraordinaire. That circumstance alone has made fans on this side of the puddle aware of him. It’s the reason why Breeders’ Cup officials are salivating for him to come here in November to run in the Classic. Meanwhile, concern is growing in the Empire State that Santa Anita, and not Belmont Park, which has been passed over repeatedly, will get the nod to host the 2012 Breeders’ Cup. A decision is coming this week or next. Last night, Pulitzer Prize winning author T.J. Stiles, who wrote The First Tycoon, drew a record crowd of almost 400 people at the Canfield casino for his History Museum dissertation on the life of Cornelius Vanderbilt. Heather Mabee, whose mother Marylou Whitney was married to Cornelius Vanderbilt Whitney, attended the event.